Your door is counterbalanced by either torsion or extension springs that store the force necessary to help the motor move the garage door. Torsion springs twist their coils to provide that force, while extension springs stretch out and spring back to accomplish the same goals. Stretching is harder on a spring than twisting, which means that extension springs wear out faster than torsion springs. Extension springs also require a safety cable to prevent accidental injury to people or objects in the vicinity when they break. Although they are more expensive initially, more people are turning to the sturdier, safer torsion springs as an investment that will prevent their springs from needing to be replaced as frequently. No matter which kind you choose, we have the experience to install them for you quickly and safely. A broken spring on one side can slant your door, placing strain on the rest of the parts and often resulting in a door that cannot move. Uneven wear on the springs, unbalanced springs, or worn cables can also lead to a break or cause even more parts to become damaged. Without springs, neither the motor nor you are strong enough to raise the door above your head, meaning that your vehicle may be stuck in the garage or must be left out in the elements until you have the spring replaced. 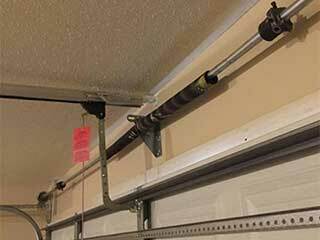 Fortunately, we are experts in garage door spring replacement and can quickly get you rolling again. Our service technicians at Garage Door Repair Altamonte Springs provide reliable service time after time to make sure that you're never stuck with a broken door for long. Our repair professionals have all the training they need to make your experience with us one hundred percent satisfactory. Call now for information about pricing and to schedule your appointment with us.